Riding into the Monday morning sun on the last day of 30 Days of Biking. 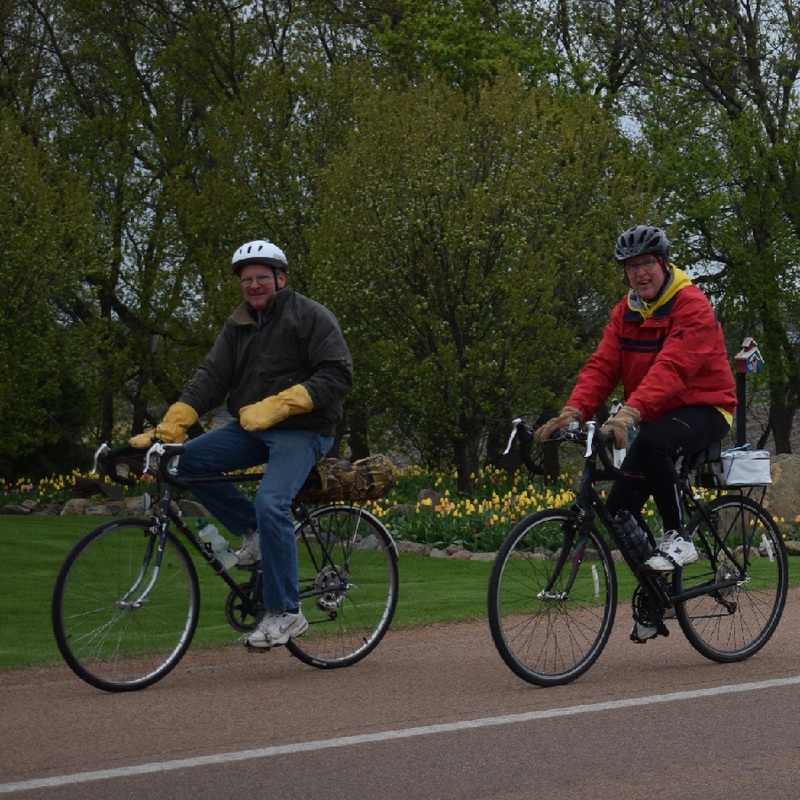 Today’s photo was taken couple years ago of these two biker chicks, on a Minnesota Ironman Bicycle Ride. 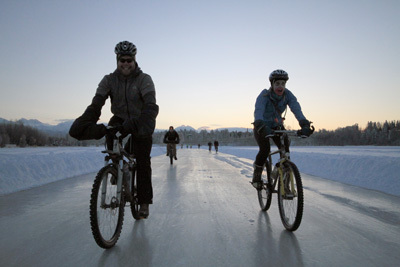 What a fun way to enjoy the weather and end #30Daysofbiking in April! 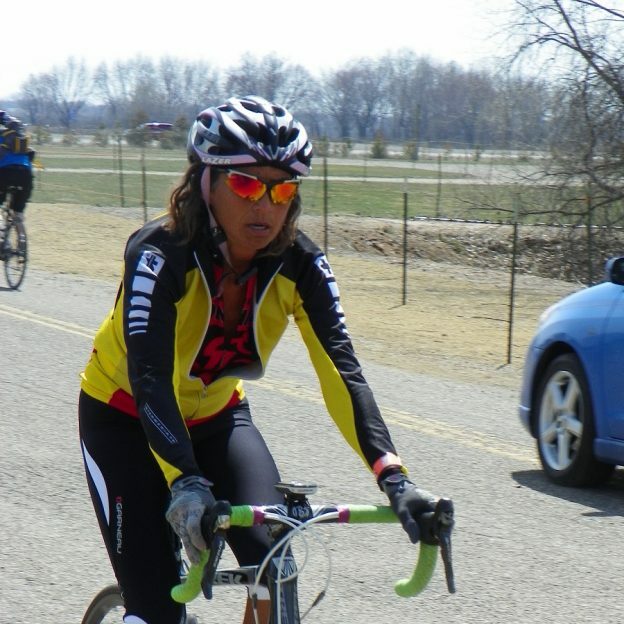 This entry was posted in Picture of the Day and tagged bicycle pic, bike commute, Bike Iowa, bike picture, bike tour, bike touring, bike tourism, bike Washington County, biker chick, Minnesota Ironman Bike Ride, pictureperfect, riding into the sun, road bike, sun glasses on April 30, 2018 by Russ Lowthian. In the late 1920’s, in France, there was a bike race under way and it wasn’t the Tour De France. 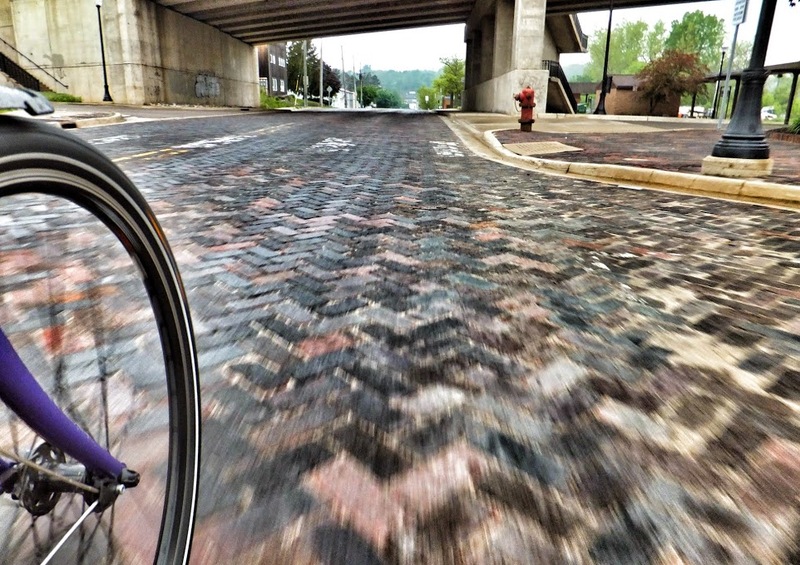 Instead, this race was a technological race that brought the derailleur into the light. Before 1928, bicycles had a maximum of two speeds, and you needed to remove the rear wheel to change those gears. As there was need for quicker shifting, the bicycle derailleur was born. Initial derailleurs consisted of nothing more than paddles that were actuated by steel rods located between the rider’s legs. Needless to say, there was a lot of finesse that went into shifting those bikes. Then after the second world war parallelogram derailleurs, what we use today, were developed so riders could shift their gears with ease. Read on to see how to get the most out of 100 years of technological advancements. You will find adjusting your front derailleur is easy if you follow these steps. Limit screws (A) – The front derailleur needs to work within the largest and smallest ring. Limit screws work to stop the front derailleur from shifting outside of its intended range. They are adjustable as to match different types of cranks. 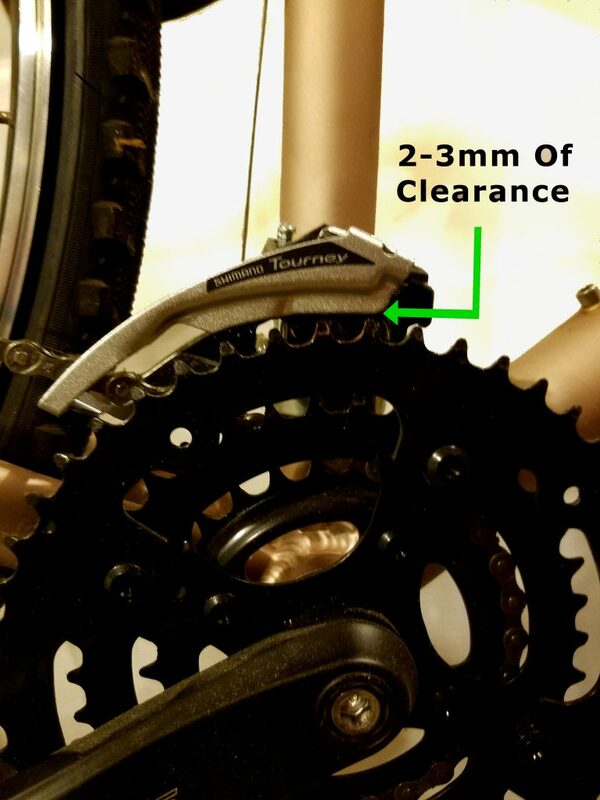 Derailleur Cage – The cage is what holds the chain on gear and what presses on the chain to move it from one gear to the next. The outer portion of the cage (C) is what helps the chain move from larger gears to smaller ones. In contrast, the inner portion of the cage (B) forces the chain from smaller gears to larger ones. Derailleur Fixing Bolt (D) – The bolt that holds the derailleur in place on the frame. By loosening this bolt, you can re-position the derailleur for angle and height. Cable Pinch Bolt (E) – The Cable that controls shifting needs to be held firmly in place. The pinch bolt does that job. You guessed it, the most important part of adjusting the front derailleur is its location. If the derailleur is not positioned properly, you will never achieve proper, noise free, shifting in all gears. 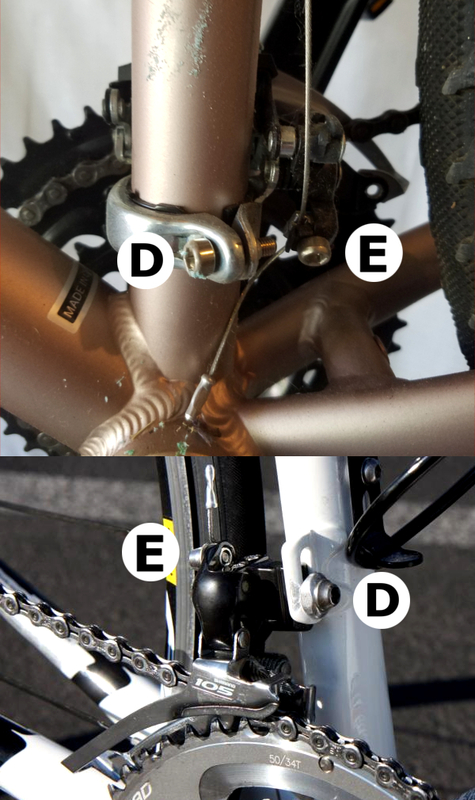 The reason location is so important is that the front derailleur cage is formed to position the chain in very specific locations. First step in adjusting the front derailleurs location is to set its height. You need enough room to fit a Nickel between the teeth on the largest chainring and the bottom of the outer cage when they are lined up. Any more clearance than that and the derailleur tends to have issues pulling the chain down from larger gears. 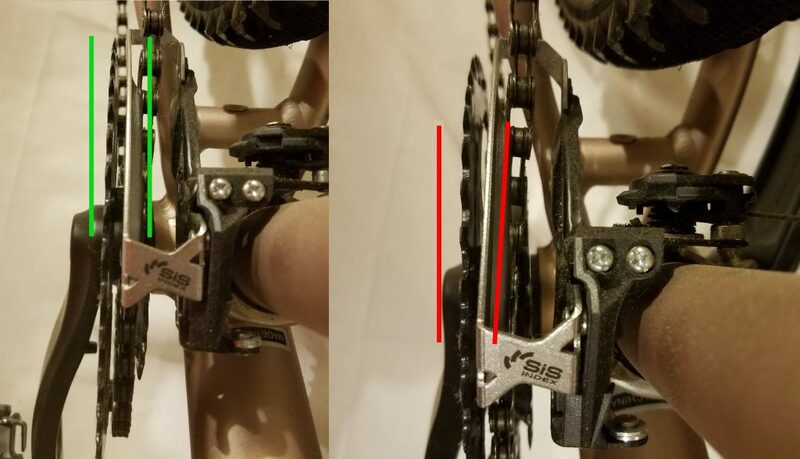 Once you have the height set, adjust the angle of the front derailleur so that the outer cage and chainrings are parallel. 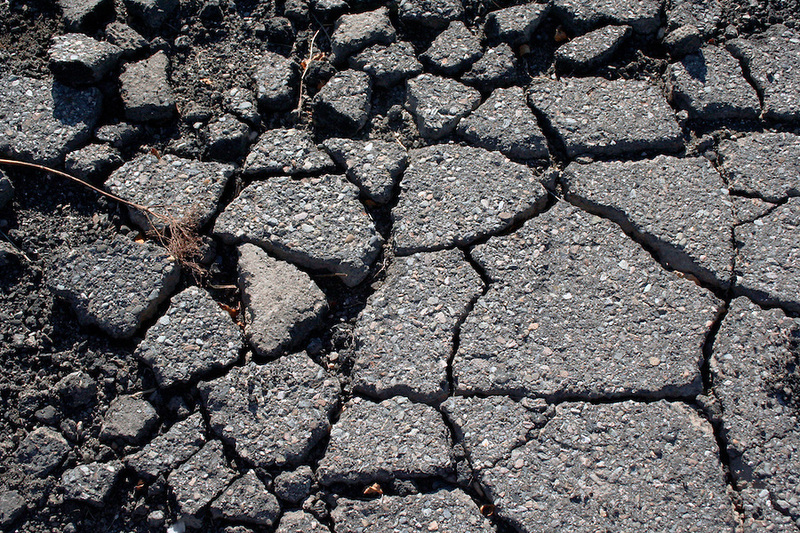 Any misalignment will result in poor shifting and excess noise. Set the lower limit by adjusting the screw marked “L”. To do this, shift the rear derailleur all the way up into the largest cog. Next check to see if there is clearance between the chain and the front derailleurs inner cage with the chain on the smallest chainring. If the chain is running on the inner cage, thread the limit screw out until you have 2-3mm (that nickel distance again!) between the chain and inner cage. When the opposite is true and you have too much clearance between the inner cage and chain, thread the limit screw in until there is 2-3mm of clearance. Your Front derailleur should be properly aligned and the lower limit should be set at this point. The next step is to attach the cable to the Pinch bolt. Attach that cable by first making sure your shifter is in its lowest gear, Then pull the cable tight, and finally tighten the pinch bolt onto your cable. Usually, you can shift smoothly up from the smallest ring into the next gear right away, but if there is hesitation going up add cable tension either through a barrel adjuster or by loosening the pinch bolt, pulling the cable tighter, and tightening the pinch bolt down again. If the chain wants to shift up from the small ring over the next ring, release some tension. You know you have it right when the chain can pass from one gear to another smoothly and confidently without any banging or skipping noises. Setting the upper limit is as easy as getting the chain onto the largest chainring and threading the limit screw to offer 2-3mm of clearance between the chain and the outer cage. 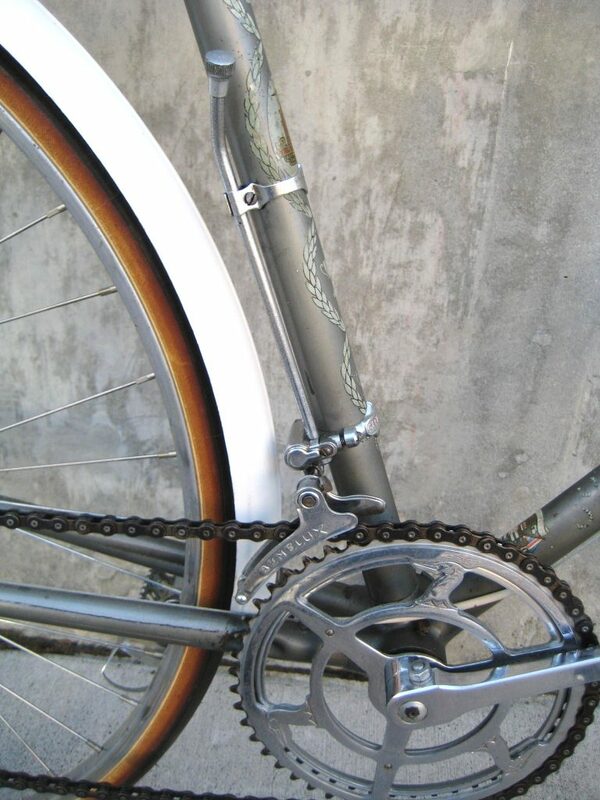 While shifting, ensure the chain cannot be shifted over the large ring and off the crank. This guide is great if all the parts are new, but won’t overcome many issues related to worn or dirty parts. The most common shifting issue with older gears is poor upshifting. 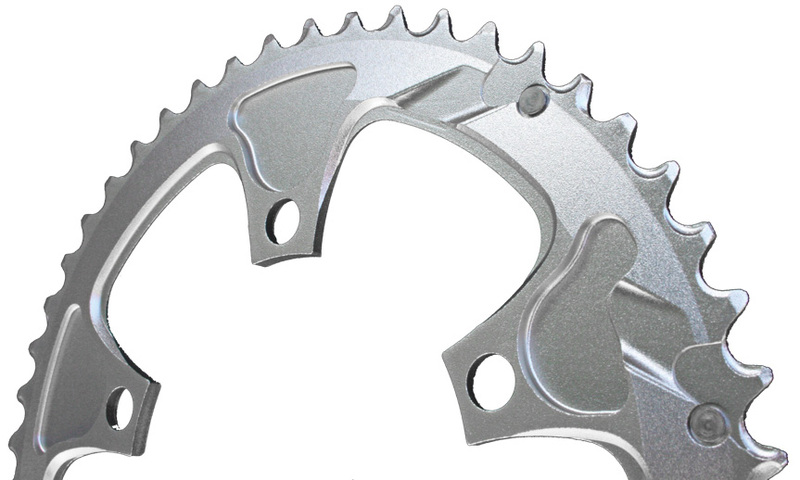 Chainrings are built with ramps on the inner surface to easily guide the chain from smaller to larger rings. As chainrings wear, these ramps wear as well. 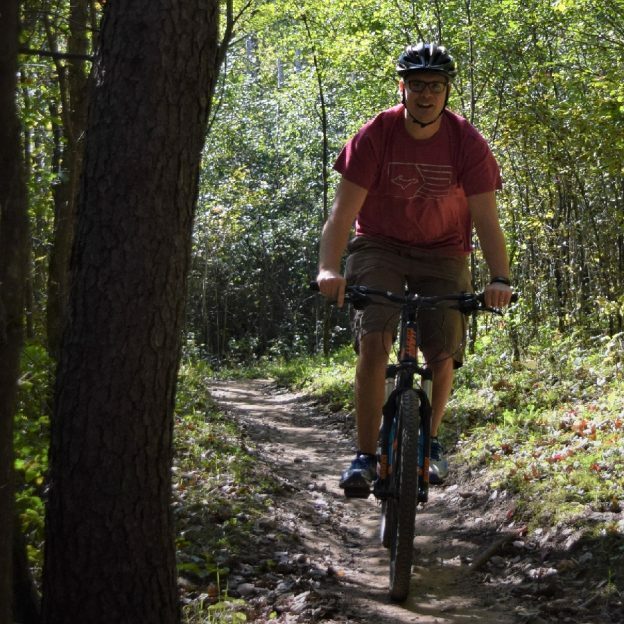 If you are having serious issues going from smaller to larger gears, but the gears are silent and problem free otherwise, you may want to consider replacing the chain, chainrings, and gears in the rear. These Praxis Works chain rings have some of the best shifting thanks to carefully placed ramps. 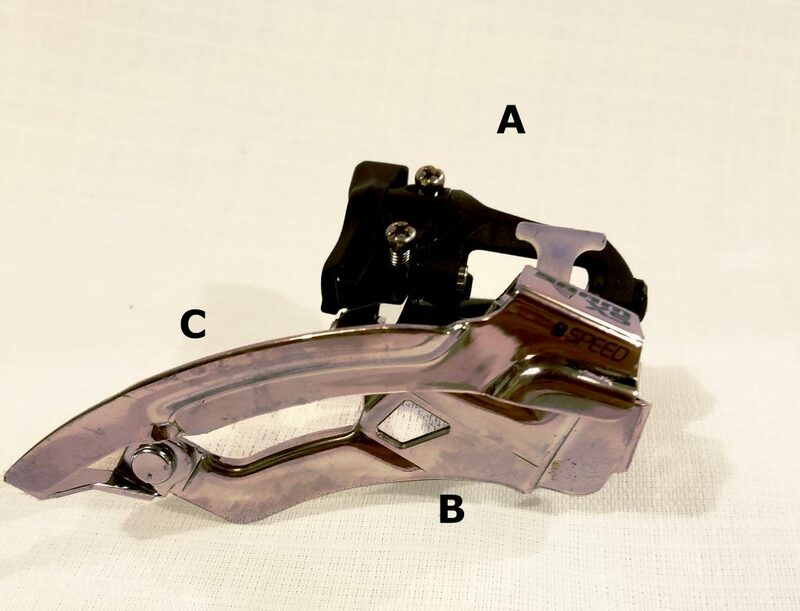 Another key wear item is the front derailleur itself. Derailleurs are designed to pivot off a parallelogram design that requires each pivot run smooth and precisely. As the Front Derailleur wears, these pivots can begin to bind, while they generate play, leading to poor shifting. Finally, dirty or corroded cables are a key cause in poor shifting. Replace cables once a year and lube them intermittently to keep them running smooth and freely. Working on your bike is fun, but can be frustrating if things aren’t going according to plan. When things get out of hand, don’t be afraid to start from scratch and go back to step one. Any missed initial steps will make further steps impossible to complete. Also, remember that if it gets too tough, your local bike shop is happy to walk you through the process. You will pay a fee, but the one on one instruction is well worth it. This entry was posted in News and tagged #shimano, Adjust Derailleur, Adjust Shifting, bike maintainance, Bike repair, Campagnolo, derailleur, do it yourself, Front Derailleur, Front Mech, HaveFunBiking, Minnesota Bike Guide, Minnesota Ironman Bike Ride, MN Bike Guide, Mountain Biking, Praxis Works, Ride My Bicycle, Ride My Bike, Road Biking Minnesota, shifter, sram on August 24, 2017 by John Brown. 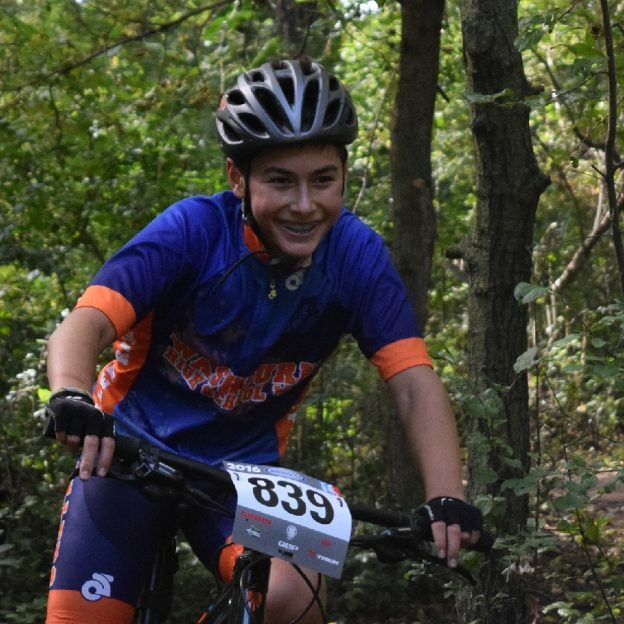 While talking with a neighbor over the weekend, he told me “I need to go get a helmet….to set a good example for my son.” Knowing my background in the cycling industry, he proceeded to ask a few questions about what he should get. In our conversation, I mentioned an earlier article “Riding safely with your kids” and reviewed all the reasons to buy a helmet and how to find the right one. Then I added some additional reasons why buying a more expensive helmet is a really good option. 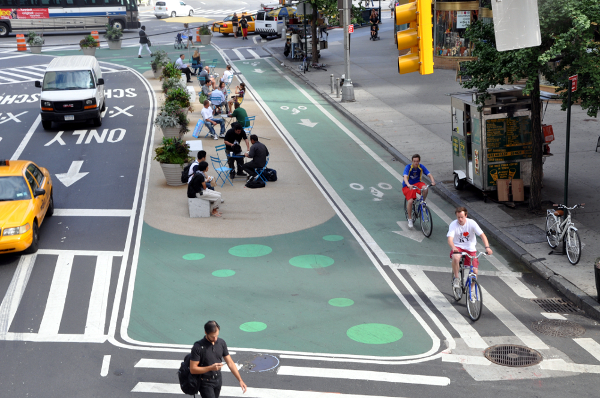 First, all bicycle helmets sold in the US need to pass CPSC tests. These tests are the baseline requirements for helmet safety in the US. So, if all helmets pass the same tests, why buy a nicer helmet? Well, there are more safety features that are available for helmets, like MIPS. 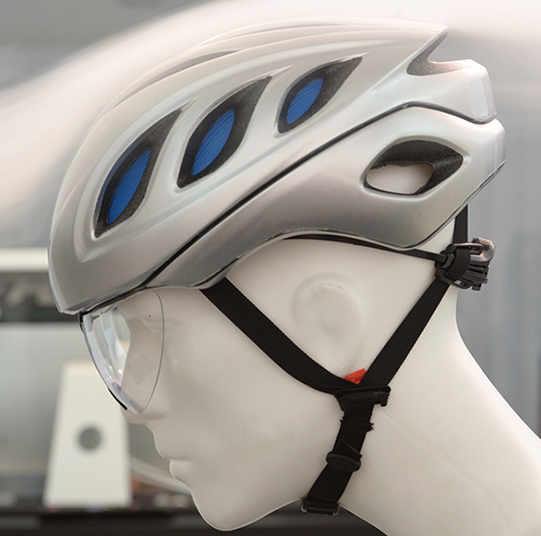 This makes a helmet safer, but the way it makes MIPS safer is not yet specifically tested for. So the first reason to buy a better helmet is safety. Beyond Safety features, the most compelling reason to buy a nicer helmet is ventilation. Ventilation is the reason helmets become more expensive. As an example, the larger holes in the helmet required for better ventilation makes it more difficult for the helmet to pass safety testing. So, to pass testing more complex molds need to be used to make the helmet, more steps are required to make the helmet and more technology is added to make the helmet. All this added process, makes the helmet both better ventilated as well as more expensive. Also, more expensive helmets are much lighter than their basic counterparts. Overall, a lighter and more ventilated helmet will be more comfortable. Another great reason to buy a nicer helmet is comfort. Nicer helmets are made in many sizes that fit different sized riders more comfortably. Additionally, they use retention mechanisms that hold the sized helmet on your head properly, so the helmet is touching your head as little as possible. As an example, Lets look at Specialized’s line of helmets. Beginning with the Align ($40), you have a well ventilated one size fits all helmet. Moving on to the Echelon 2 ($70), that helmet has larger ventilation ports, as well as 4 sizes to fit riders better. Finally, we look at the Prevail ($200) which has the largest vents, lightest weight, as well as a Kevlar, internal, roll cage to hold the helmet together on impact. 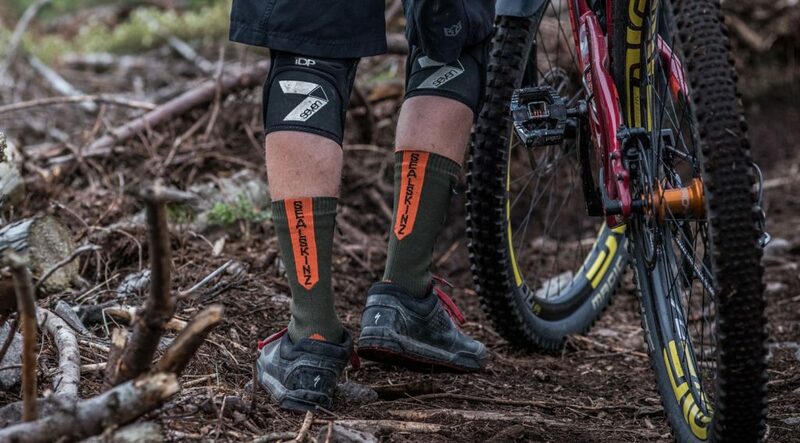 It has the most refined retention mechanism and comes in many sizes to fit riders comfortably. First thing to do is make sure the helmet you select from the many brands available Is comfortable and fits well before you purchase it. Once you find a few helmets that seem comfortable, take them for test rides on your bike (most shops will allow this if you leave an ID behind). Concentrate on what helmet is most comfortable and best ventilated. Then, buy what feels great! 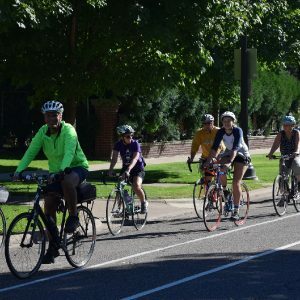 This entry was posted in News and tagged #nextbikeadventure, Bicycle Helmet fit, bike helmet comfort, bike helmet ventilation, free bike maps, helmet buyers guide, Minnesota Bike Guide, Minnesota Ironman Bike Ride, mountain biking fun, Ride My Bicycle, Road Biking Minnesota on June 10, 2017 by John Brown. The morning of Sunday, April 30th started early for me. I hit the road heading to Waconia for my first ever Minnesota Ironman. The temperature was in the high thirties and there was an overcast with a high probability of rain during the day. 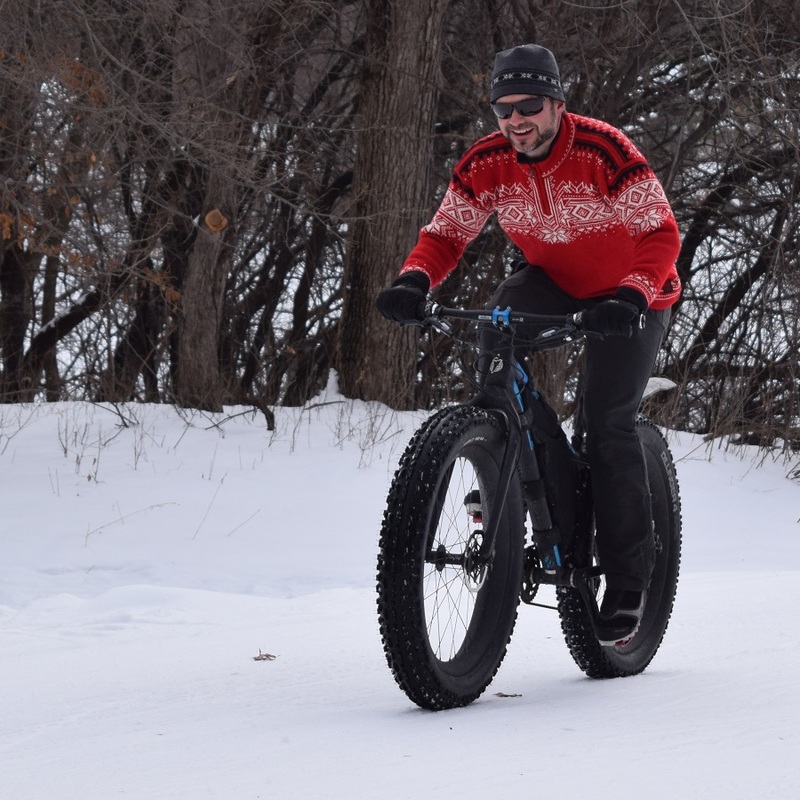 But, it is Minnesota and the Ironman is a 51 year spring time biking tradition here, right? About a half hour drive from Bloomington, I was in Waconia around 6:30 a.m. I unloaded my bike and was greeted by thousands of riders and several bike shops in front of the Waconia High School. After checking in, the weather was still holding dry at 7 a.m., but where was my riding partner? 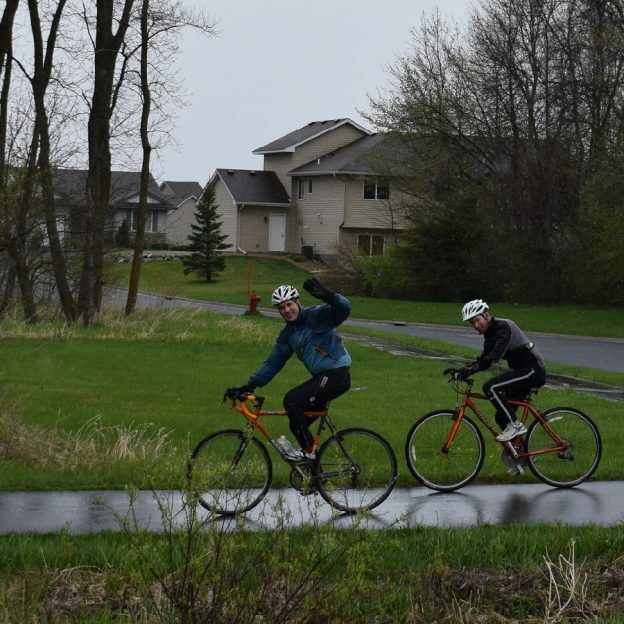 Starting the ride early, these Minnesota Ironman cyclists made it back in before the rain began. Once inside the High School, I was met by the Waconia Chamber and several exhibitors including the Waconia Brewing Company. Past the vendors, the registration table was packed with riders excited to embark on the new ride routes in Carver County. While waiting for my co-worker, Andy, to arrive before finally getting onto the course, I visited with Penn Cycle, Erik’s Bikes, VeloFix, Gateway Cycle and Park Tools. 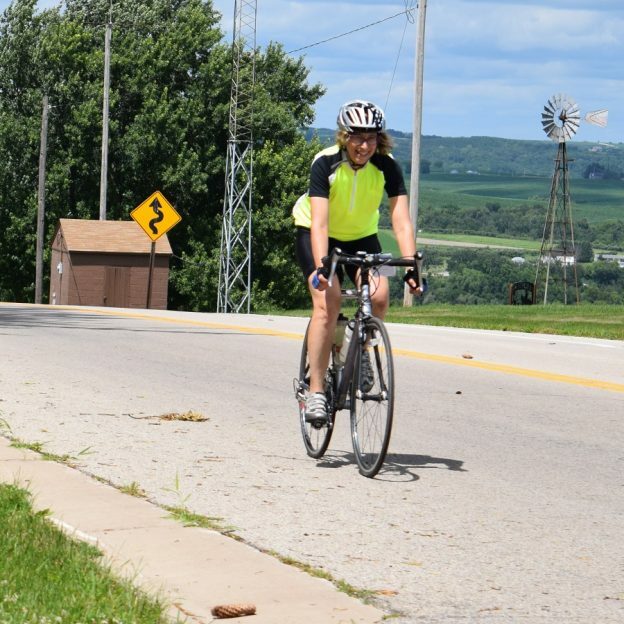 As Andy and I set out on the tan pavement of the route, we were pleasantly surrounded by the pastures and fields of Waconia’s rural area. 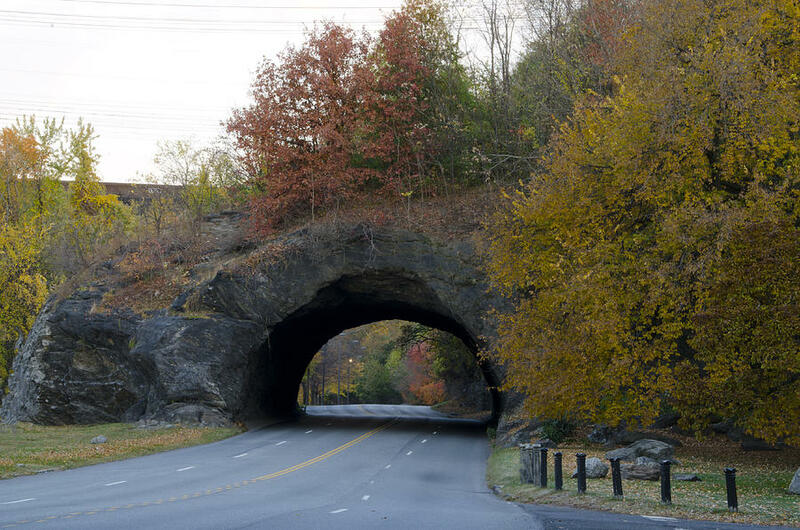 With excellent road conditions and wide shoulders, the beginning of the ride offered a bike path feel. Our planned route was to head out on the 25 mile course (purple). 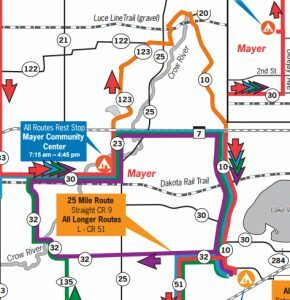 We would decide after the rest stop if we wanted to tack on the last section of the 100 mile course (orange), to make the whole ride around 40 miles for the day. This flexibility is one of the best parts of riding in Carver County out of Waconia. 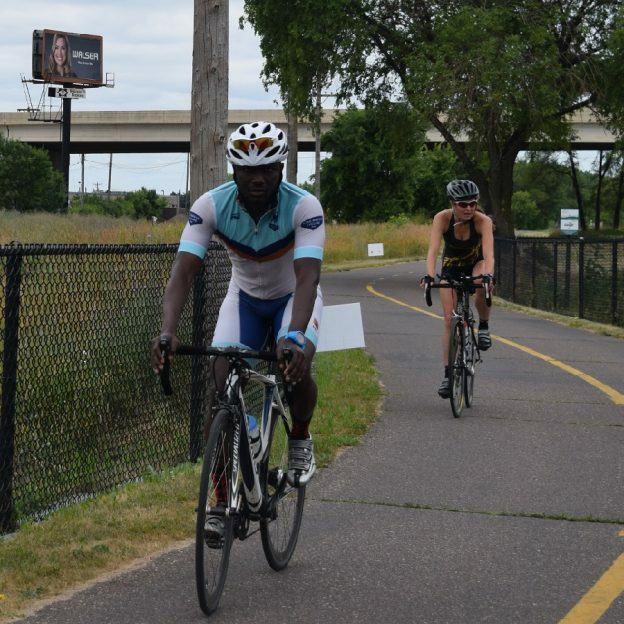 Andy has only been riding a bike for a few months, using the Minnesota Ironman as his inspiration. 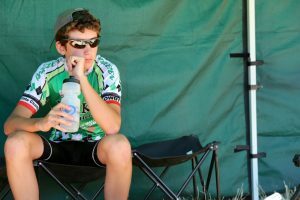 To his credit, he didn’t get an easy ride to conquer this year. Both the amble route and the weather took a left turn. 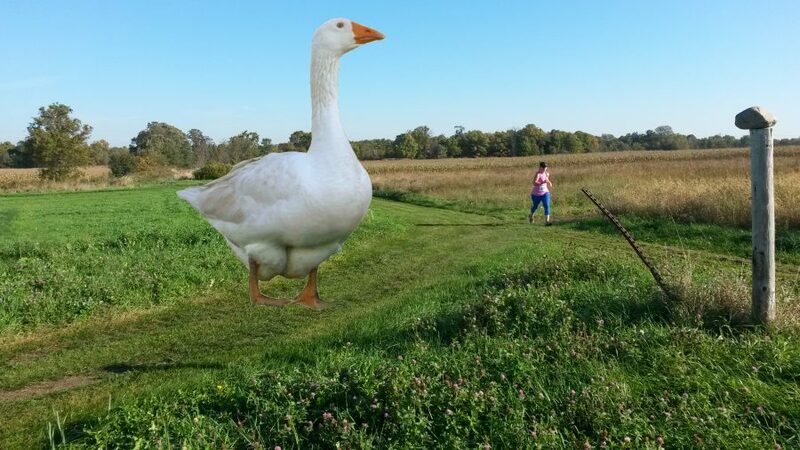 Heading west on County Road 32, we saw its beautiful and quiet charm flanked with tree farms, horses, open fields and the largest goose I have ever seen. The bad news, while on 32, it started to rain. The misty, gentle, northeast wind we started off with became a stinging cold gale once we crossed the Crow River and headed north. The constant headwind and freezing rain combined to make for the most painful type of exfoliation as we approached route 30. Now heading east, riding parallel with the Dakota Rail Trail, the damp wind was cruel. 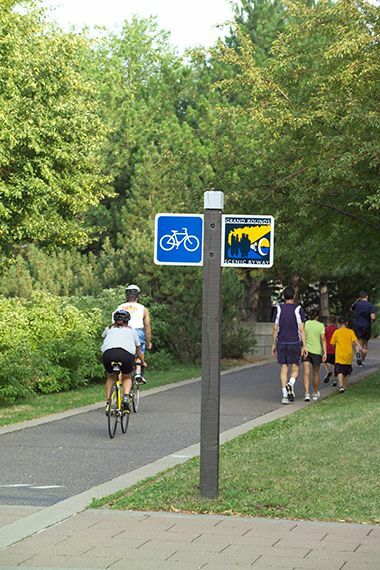 While the Dakota trail was not part of the official Minnesota Ironman course, some took to it due to the stand of trees that would help break the winds that were attacking from the north. At the end of County Road 30, we hit Mayer and found the Community Center there where the rest stop was located. The volunteers were simply amazing. The food was ample and tasty. Plus, Penn Cycle and Spokes Bike Shop were there to handle any mechanical issues that may arise. Andy and I grabbed a quick snack, warmed up, had the pros at Penn check our bikes and rolled out before the cold set into our bodies. We decided to stick with the standard 25 mile route, concerned that the weather would be getting worse. Now on route 7, crossing the Crow River again, there seemed to be no end to the beautiful scenery of Carver County. My focus was to get to County Road 10 and enjoy the tailwind as quickly as possible. Any discomfort we felt over the last several miles would soon be rewarded once we turned south on 10. Now the hero, the wind at our backs allowed us to enjoy the gorgeous rolling hills that were breathtaking. Thanks to the tailwind helping us, we flew toward Waconia High School with relative ease. The farms made way for the Wahibo Marsh, home to dozens of beaver dams and countless feathered residents. Andy Ellis Completing his first Minnesota Ironman Bike Ride in Waconia, MN. Soon, we spun back into Waconia High School with the wind still at our back. The finish line and Red Bull arch signaled our completion of the 2017 Minnesota Ironman. This also secured our our well deserved bragging rights. Overall, the only complaints for this ride was the weather, which no one could control. As for the course, support, organization and camaraderie, I give this ride nothing but accolades. I know I will be riding this area throughout the summer. When organizing my 2018 calendar, I will be sure to leave the last week of April open for the next Minnesota Ironman. 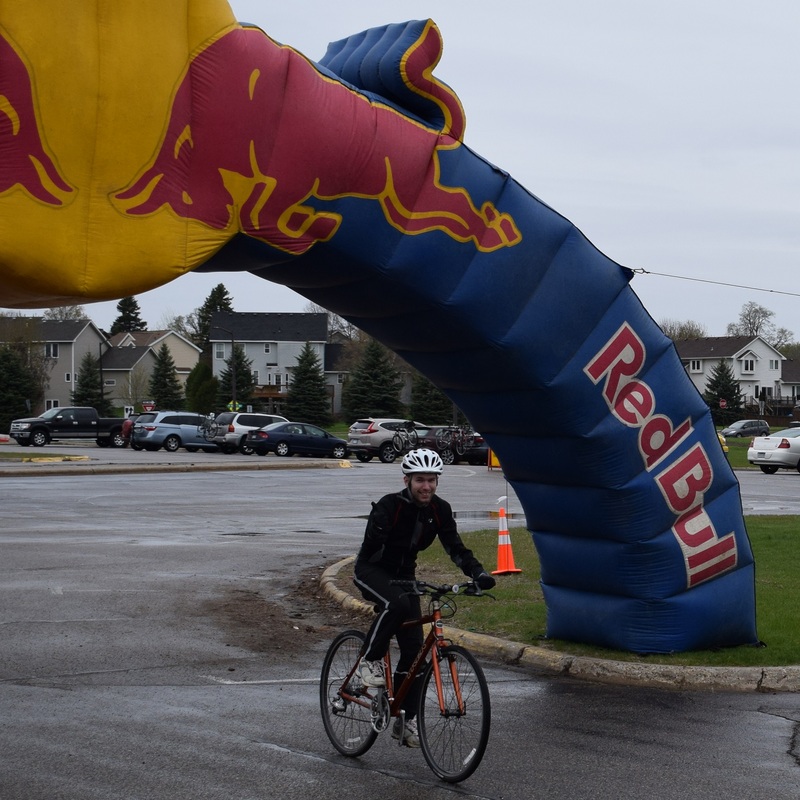 This entry was posted in News and tagged #bicycle, #nextadventure, #onlyinMN, Bike Guide Minnesota, bragging rights guaranteed, Carver County MN, Minnesota Ironman Bike Ride, MN Bike Guide, Road Biking Minnesota, Waconia Brewery, Waconia Chamber of Comerce, Waconia MN on May 3, 2017 by John Brown. 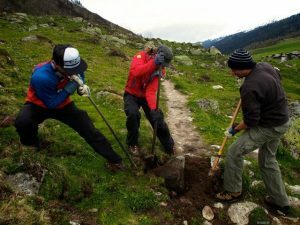 Giving back to the trails, paths, roads and events you enjoy is a great way to stockpile some good karma and it’s fun! There are countless ways to give back. 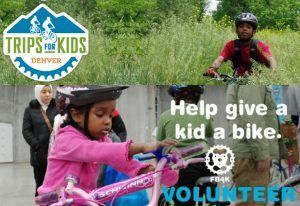 For example, you can volunteer to support rides, clean up a trail system, build a trail, support high school athletes, and get bikes for new riders. Read on for some more details. 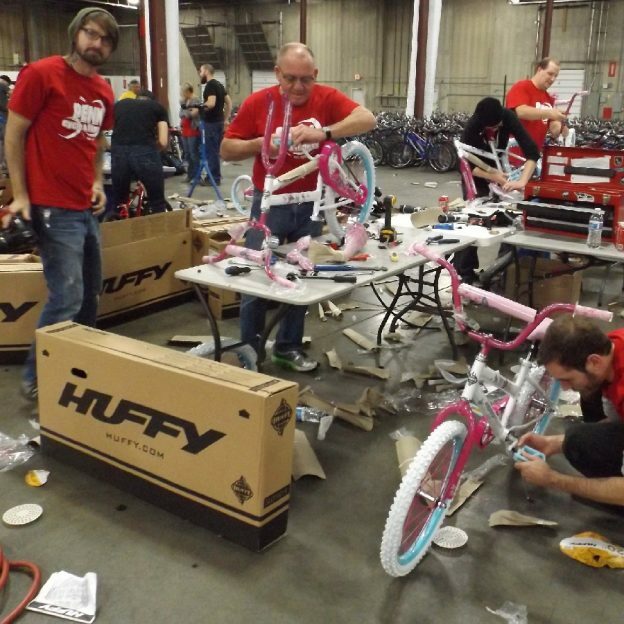 There is always a need for volunteers at bicycle events. Because of that need, many events offer exceptional perks to anyone donating their time. 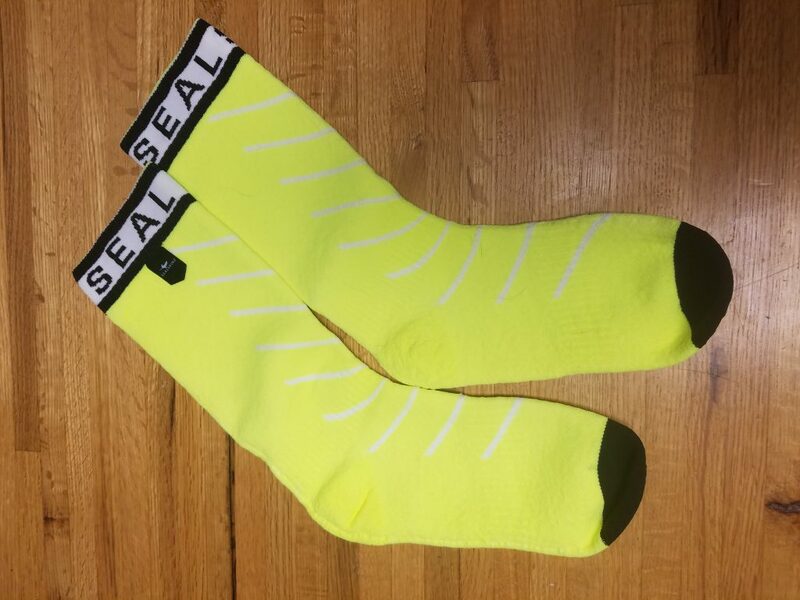 Examples are; being able to earn free entrance into the Bike New York ride, getting preferential registration position to enter into Ironman races that quickly fill up, and meeting professional cyclists at Gran Fondo events. 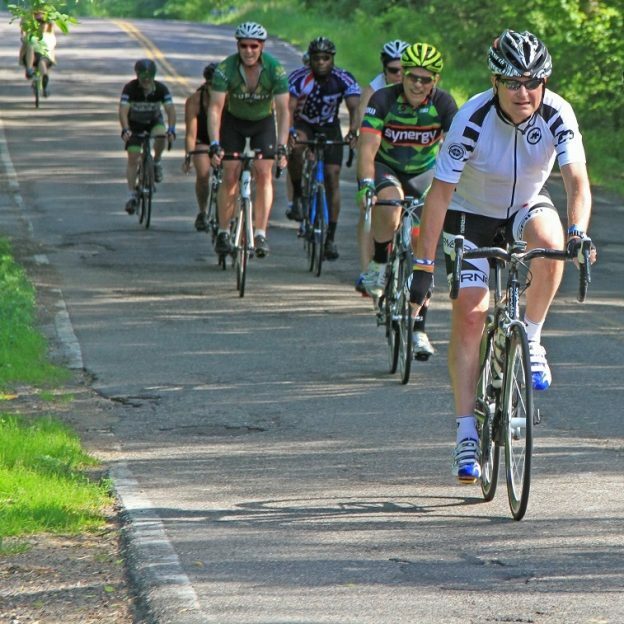 Moreover, the largest perk in giving back is helping your fellow riders have a great time. 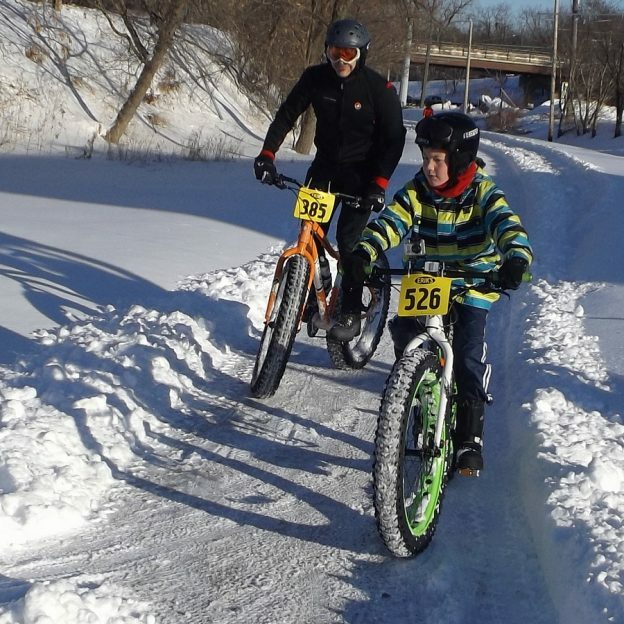 This entry was posted in News and tagged #freebikes4kidz, #mountainbiking, #nextadventure, Bike New Your, free bikes for kidz, Giving back, gran fondo, IMBA, Ironman, keep kids riding, Minnesota Ironman Bike Ride, MORC, Mountain Biking, NICA, Penn Cycle, Ride My Bicycle, Ride My Bike, Road Biking Minnesota, trail building, trips for kids on April 7, 2017 by John Brown.